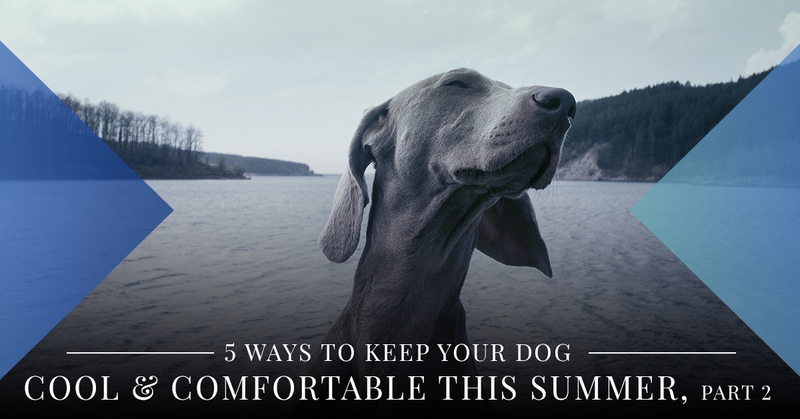 Here are five more tips to help your dog stay comfortable and cool this summer. Remember, when you want pet care advice from a veterinarian, need a pet exam, require dog boarding, or want to bring your dog in for doggy daycare, our animal care team at Eagle Animal Hospital and Pet Resort is here for you and your canine companion. Always avoid leaving your precious pup in a vehicle (anytime) but especially during the hot summer. Temperatures in your car can increase rapidly — within a matter of seconds, in fact. This can cause your dog heat exhaustion, health problems, and can even lead to death. Even if you’re just running into the store for one thing, never leave your dog in a hot car. Giving your dog frozen treats can cool them down. Freeze blueberries, strawberries, and carrots for a cold, refreshing treat. You can even mix these fruits with water and make doggy popsicles. Another trick is to roll wet food into small portions and freeze them. You can put these in Kong® toys which gives them a frozen treat that they have to work to get to. Ice cubes are also good treat options, but try to avoid giving them sharp pieces of ice. Taking your dog for a swim is always a great way to cool them down. Just make sure the water is OK for them to swim in. If you take them to a larger body of water for a dip, consider getting your dog a lifevest to ensure their safety. Plus, you can always get a kiddie pool for them to lay in the backyard on those hot summer days. A professional dog grooming can remove excess hair and help prevent shedding. Plus, a professional groomer can use dog-friendly products that can treat dry, itchy skin which is common during summertime. A professional dog groomer also knows how much or how little hair and fur to remove from your dog’s specific breed, which can keep them cool while also protecting them from getting sunburned. If you have any questions or concerns about keeping your dog cool and safe this summer, please give our animal hospital in Kansas City a call. Our friendly, knowledgeable, and compassionate veterinarians and support staff are always here for you and your furry friend. Whether you need to schedule a pet exam, have a pet emergency, or want to learn more about our dog boarding and doggy daycare facility, we would be happy to assist you in any way we can. Contact our pet care team at Eagle Animal Hospital and Pet Resort, where we will always treat your pet as if they were our own.